Those heavy pallets aren’t always where it’s convenient for you, so finding a way to move them with the least amount of risk and most efficiency can be a huge task. Our mobile scissor lifts make grabbing heavy cargo and loading and unloading it whenever and wherever you need easy and fast. These are giants on wheels, taking on the heavy burden of loads that can be very unwieldy, but making it portable and safe. 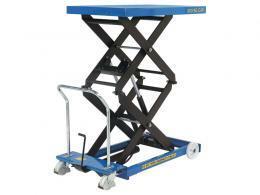 The mobile scissor lifts make it easy for your employees to fill a palette and unload it without harming themselves. The wheels are durable and move smoothly, so that you can place the table where you need it to get the work done with legs that are adjustable to a height that makes doing the work easy. Because of their portability, mobile scissor lifts are great for taking directly to trucks, vans or even ships for loading and unloading. This means they work well at warehouse loading docks, harbours, and even on a moving truck to help move heavy items from one site to another with little effort. 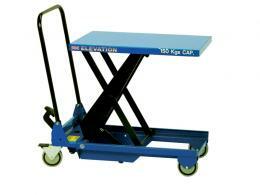 Our mobile scissor lifts offer exceptional lifting capacity and quality. 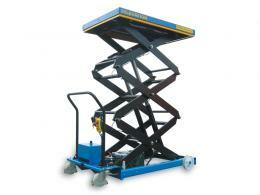 Our triple scissor lift pushes the limit with higher reach and heavier weight ability. Or you may like our budget scissor lift, which is cost efficient and strong, giving you the option of managing smaller cargo, but with the same attention to ease, durability and strength. Mobile scissor lifts also make great on-site worktables, easy to move onto a factory floor to go over orders, plans or anything that supports the business at hand. Our wide range of lifts come with a one-year warranty and a Price Promise to match any price. 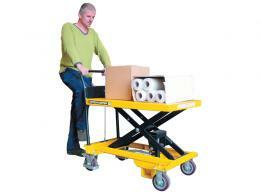 Buy your perfect lifting solution today and get speedy free UK delivery. We accept all major credit cards, including Maestro, MasterCard and Visa. Plus we accept payment via PayPal.